Today was Setsubun, which I explained in detail here. Since I didn’t participate in any of the usual traditions, it was just a regular day for me. During the day I went for a haircut at QB house near Seiyu. QB House is famous for their traffic light sign outside the store that indicates how long you have to wait, and for their 10 minute, 1000 yen haircuts. The barber who cut my hair was extremely friendly, and turned a simple haircut into an energetic show. Unfortunately friendly does not cancel out a communication barrier. I now look like a cross between an English soccer hooligan and a reject from a punk band. Thanks to the internet, I was able to finally start watching the final season of Friends. I have liked the show for a long time, and it’s going to be good to see how it ended. Friends is one of those shows that probably stayed on the air a year or two longer than it should have, but there were piles and piles of money to be made. Speaking of money, don’t EVER download TV shows from the internet for free. It’s just plain wrong. It is your duty to sit through at least 6 minutes of commercials during every 30 minutes of entertainment. If you do accidentally find copies of downloaded TV shows on your computer, you are pretty much obligated to look up a list of the show’s sponsors and go buy their products. 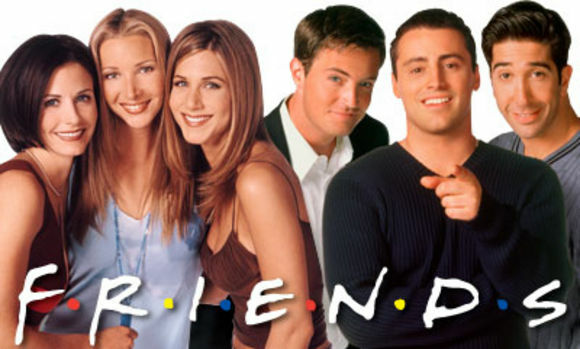 Regardless of how you choose to legally view Friends, it is a show that I always recommend to students who are looking for more exposure to conversational English. The characters on the show mostly talk about jobs and relationships, and there are usually a lot of visual clues to help fill in the context of the conversation. Other than the really wacky episodes with monkeys or dance routines, Friends is a fun way to practice listening to natural English conversation. (2015 Update) I was excited to find that friends is now available on Netflix. However, they took the original 4:3 picture and trimmed off the top and bottom to completely fill today’s 16:9 standard. Yes, in the interest of filling up the whole screen, they cut off part of the picture. Everyone please stop doing this!!! Tonight in the Hello House common room people were watching Ally McBeal. I hate Ally McBeal. To fix the situation, I busted out my homemade VCD copies of Friends Season 9 that I brought to Japan. I was very proud of my VCDs – I took a lot of effort to make a menu title screen with graphics and everything. The good news was that I watched 9 back to back episodes before calling it a night. This was much, MUCH better than Ally McBeal. The bad news was that I lost 500 yen in a bet with TimTam that she couldn’t stay awake for the entire 9 episode marathon. The wild times never stop in Hello House!